Fishers Island Telephone Corporation History – Fishers Island Utility Co. The first submarine cable between the mainland and Fishers Island was laid by the New London and Fishers Island Telegraph Co.
Fishers Island Telegraph Co. was purchased by the Ferguson brothers. The Fishers Island Telephone Co. was incorporated and new cables were laid by the Southern New England Company in July 1892. An infrastructure upgrade was part of the Olmsted Plan with brand new telephone lines and poles being set up throughout the east end of Fishers Island. By 1926, the company had 128 customers on Fishers Island’s west end and 14 customers at the east end. They reported that year that out of an island-wide total of 200 houses (175 west end and 25 east end), there were 164 telephone “stations” and 38 extensions. A new submarine cable was laid from Groton Long Point to Fishers Island. The change was exponential and reflected the push for modernization that accompanied the Olmsted Plan’s development of the east end in the mid-1920s. In order to provide call-waiting and other new features to it’s services, the telephone company installed a digital switching system. Today there are 1,000 dedicated telephone lines in service on Fishers Island. 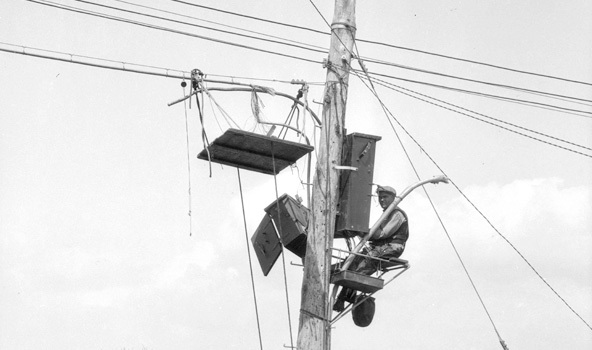 Island Telephone, A Brief History – View photo gallery on The Henry L. Ferguson Museum website.